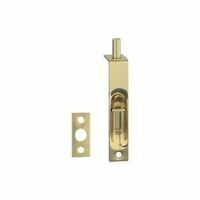 National Hardware Flush Bolt, Series: V1920, 4 in Bolt Length, Solid Brass, Solid Brass, For used to secure a door to a jamb on french, patio, wood, double or other doors Deep cup for good finger hold and easy operation. Unique spring design holds bolt automatically in retracted or projected position. 5/16" diameter bolt head, 3/4" throw. O.A. Size 4"L x 3/4"W x 1-1/8"D. Polybagged. Screws included. Deep cut and double action spring combine to assure ease of operation and autoholding of bolt projected or retracted. Packed with screws. 1/2" diameter bolt head, 1" throw. Polished solid brass faceplate and one piece aluminum rod and bolt. Specifically designed with face plate rounded for simple one-step router installation. O.A. Size: 6"L x 3/4"W x 1-5/16"D. Polybagged.